Are the Swiss more bigoted than other Europeans? Probably not. Referendums are a measure of popular gut feelings, rather than considered opinion, and popular gut feelings are rarely liberal. Referendums on this issue in other European countries might well produce startlingly similar results. 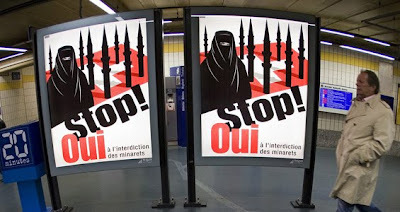 To attribute the Swiss vote to ban minarets – an idea that was promoted by the right-wing Swiss People's Party, but by none of the other political parties – to "Islamophobia" is perhaps to miss the point. To be sure, a long history of mutual Christian-Muslim hostility, and recent cases of radical Islamist violence, have made many people fearful of Islam in a way that they are not of Hinduism, say, or Buddhism. And the minaret, piercing the sky like a missile, is easily caricatured as a fearsome image. But if the Swiss and other Europeans were self-assured about their own identities, their Muslim fellow-citizens probably would not strike such fear in their hearts. And that might be the problem. It was not so long ago that the majority of citizens in the western world had their own unquestioned symbols of collective faith and identity. The church spires that grace many European cities still meant something to most people. Few people married outside their own faith. Until recently, too, many Europeans believed in their kings and queens, flew their national flags, sang their national anthems, were taught heroic versions of their national histories. Home was home. Foreign travel was for soldiers, diplomats, and rich people. "Identity" was not yet seen as a problem. Much has changed, thanks to global capitalism, European integration, the stigmatisation of national feeling by two catastrophic world wars, and, perhaps most importantly, the widespread loss of religious faith. Most of us live in a secular, liberal, disenchanted world. The lives of most Europeans are freer now than ever before. We are no longer told what to do or think by priests or our social superiors. When they try, we tend not to take any notice. But there has been a price to pay for our newly liberated world. Freedom from faith and tradition has not always led to greater contentment, but, on the contrary, to widespread bewilderment, fear, and resentment. While demonstrations of collective identity have not entirely disappeared, they are largely confined to football stadiums, where celebration (and disappointment) can quickly boil over in violence and resentment. Populist demagogues blame political, cultural, and commercial elites for the anxieties of the modern world. They are accused, not entirely without reason, of imposing mass immigration, economic crisis, and loss of national identity on ordinary citizens. But if the elites are hated for causing our modern malaise, the Muslims are envied for still having faith, for knowing who they are, for having something that is worth dying for. 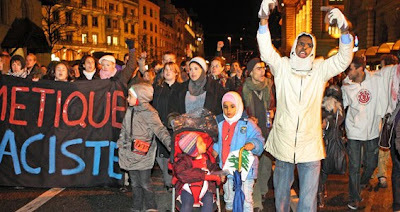 It is unimportant that many European Muslims are just as disenchanted and secular as their non-Muslim fellow-citizens. It is the perception that counts. Those soaring minarets, those black headscarves, are threatening because they rub salt in the wounds of those who feel the loss of their own faith. It is not surprising that anti-Muslim populism has found some of its most ferocious supporters among former leftists, for they, too, have lost their faith – in world revolution, or whatnot. Many of these leftists, before their turn to revolution, came from religious backgrounds. So they suffered a double loss. In their hostility to Islam, they like to talk about defending "Enlightenment values," whereas in fact they lament the collapse of faith, whether religious or secular. There is, alas, no immediate cure for the kind of social ills exposed by the Swiss referendum. The Pope has an answer, of course. He would like people to return to the bosom of Rome. Evangelical preachers, too, have a recipe for salvation. Neo-conservatives, for their part, see the European malaise as a form of typical Old World decadence, a collective state of nihilism bred by welfare states and soft dependence on hard American power. Their answer is a revived western world, led by the United States, engaged in an armed crusade for democracy. But, unless one is a Catholic, a born-again Christian, or a neo-con, none of these visions is promising. The best we can hope for is that liberal democracies will muddle through this period of unease – that demagogic temptations will be resisted, and violent impulses contained. After all, democracies have weathered worse crises in the past. The result looks likely to cause strife where there was relative peace, sully the country's image abroad, damage investment and trade with the Muslim world, and set back efforts to integrate a population of some 400,000 Muslims, most of whom are European Muslims – and non-mosque-goers – from the Balkans. The campaign to ban minarets was described by the country's justice minister as a "proxy war" for drumming up conflict between ethnic Swiss and Muslim immigrants. But the ban was supported by a majority of 57.5%, 20 percentage points more than predicted in opinion polls in the run-up to the vote. Muslim leaders from around the world, senior church figures, European politicians and human rights experts have deplored Switzerland's decision to ban the building of minarets. The polarising verdict in a Swiss referendum held yesterday raised fundamental questions about discrimination and freedom of religion, with the Swiss government itself doubtful over whether the popular vote could be translated into national law, as required by the country's system of direct democracy. "Scandalous," said the French foreign minister, Bernard Kouchner, while Babacar Ba, a senior official of the Organisation of the Islamic Conference, warned of an "upsurge in Islamophobia" in Europe. But far right leaders in Europe applauded the Swiss vote and called for parallel prohibitions in other countries. There are only four minarets in Switzerland, so why is it that it is there that this initiative has been launched? My country, like many in Europe, is facing a national reaction to the new visibility of European Muslims. The minarets are but a pretext – the UDC wanted first to launch a campaign against the traditional Islamic methods of slaughtering animals but were afraid of testing the sensitivity of Swiss Jews, and instead turned their sights on the minaret as a suitable symbol. Every European country has its specific symbols or topics through which European Muslims are targeted. In France it is the headscarf or burka; in Germany, mosques; in Britain, violence; cartoons in Denmark; homosexuality in the Netherlands – and so on. It is important to look beyond these symbols and understand what is really happening in Europe in general and in Switzerland in particular: while European countries and citizens are going through a real and deep identity crisis, the new visibility of Muslims is problematic – and it is scary. At the very moment Europeans find themselves asking, in a globalising, migratory world, "What are our roots? ", "Who are we? ", "What will our future look like? ", they see around them new citizens, new skin colours, new symbols to which they are unaccustomed. Over the last two decades Islam has become connected to so many controversial debates – violence, extremism, freedom of speech, gender discrimination, forced marriage, to name a few – it is difficult for ordinary citizens to embrace this new Muslim presence as a positive factor. There is a great deal of fear and a palpable mistrust. Who are they? What do they want? And the questions are charged with further suspicion as the idea of Islam being an expansionist religion is intoned. Do these people want to Islamise our country? Why is Amir Khan not a superstar? Can a Muslim say happy Christmas to his friends?